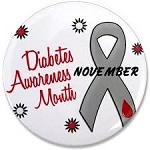 November is Diabetes Awareness Month and November 14 is World Diabetes Day. The Canadian Diabetes Association (CDA) is taking this opportunity to drive diabetes awareness, as the disease has reached epidemic proportions in Canada. Millions of people around the world unite and celebrate on November 14 in honour of World Diabetes Day (WDD). WDD is a day created to draw awareness to the growing concerns surrounding diabetes and the escalating health threat it poses.